The 'Water Monitoring in Colombian Vulnerable Communities in a Post-Conflict Scenario' project, financed by the Newton Fund Institutional Links, has developed an integrated sensing device for testing water which can easily be used by non-experts. The device not only provides a simple and real-time way of testing water systems, it can also simultaneously upload the findings to a web-based platform via a mobile app. The online resource stores the information and visualises the sampling location on a map. The acquired data is public and can be accessed anytime from anywhere in the world. The device measures four key physico-chemical variables in water, including pH levels, conductivity, temperature and dissolved oxygen. It also monitors the presence of heavy metals in water, including mercury. Colombia is the third most mercury-contaminated country in the world, largely due to intense illegal metal mining. The mercury significantly pollutes the water and sediments of rivers, including parts of the River Amazon. The pollution builds up in the food chain, primarily within fish consumed by local people, but it can also reach fruit and vegetables through irrigation. In the dry season, river water becomes the major source of drinking water in many areas. Rural indigenous communities are particularly suffering from mercury pollution. Large numbers of rural municipalities and indigenous territories in Colombia are currently affected by this contamination, with high rates of mercury-related diseases resulting in foetus malformations and brain disorders, rates which are increasing every year. The multisensing device was tested with the indigenous community of the Resguardo Santa Sofia, located at the southern tip of the Amazonas region of Colombia. The research team spent nearly three weeks in the Amazon testing the sensor to ensure it met their needs and was easy to use. 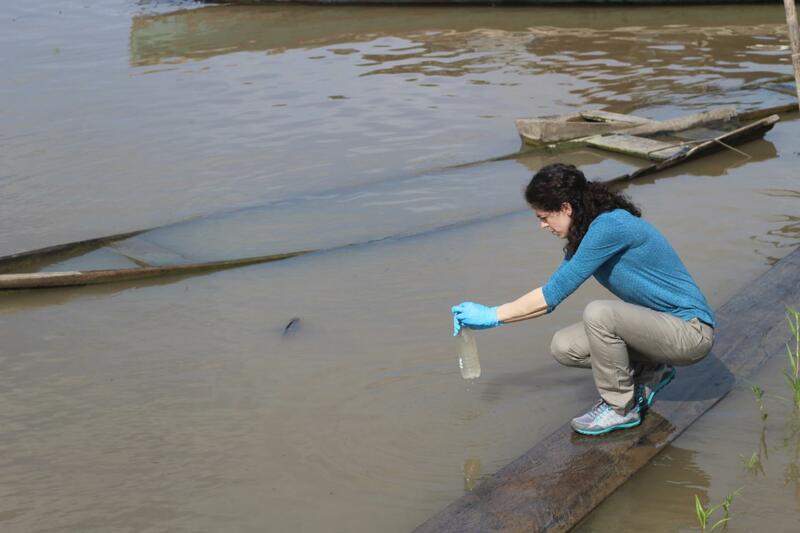 Project leader and Senior Lecturer in the University of Bath's Department of Chemical Engineering, Dr Mirella Di Lorenzo, said: "Due to the lack of financial resources and technology, communities like Santa Sofia in the Amazon have no means of checking if the water they are surrounded by is safe to use. This multi-sensing device can have a massive impact to these communities, allowing them to easily check if the water they are using is safe to do so." The researchers expect that by being able to map out areas of water affected by mercury as well as providing water users with key water variable readings, this approach will help prevent the spread of water-borne diseases. Their vision is that communities are empowered with a means of testing a water supply themselves whilst authorities are provided with evidence of water affected by illegal mining allowing them to act and mitigate this activity. Dr Alba Graciela Avila Bernal, Associate Professor at the Universidad de los Andes, and Co-Investigator in the project commented: "Humans have contaminated many regions in the world and it is a particular shame we have contaminated the Amazon. "By combining our expertise in participatory design and humanitarian engineering with the sensing expertise at the University of Bath, we have provided this community with a reliable and affordable way of testing the water they so heavily depend upon." This multidisciplinary and multi-cultural project, funded by the Newton Fund Institutional links, has brought researchers from the University of Bath's (UK) Water Innovation & Research Centre (WIRC @ Bath) and Centre for Sustainable Chemical Technologies (CSCT) together with researchers from Universidad de los Andes' Faculties of Economics and Engineering, combining their expertise to the benefit of a vulnerable community in one of the most remote parts of Colombia: the Amazon. The researchers are now aiming to further improve the device by making it more intuitive and smaller; thereby making it easier for a technology that can be used by rural communities. The researchers are hopeful that this potentially life-changing device can be produced on a large scale and that collected data could be used by leaders in the communities and policy makers.